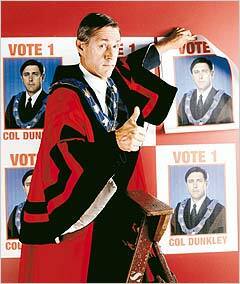 Vote early, vote often… Geoff Morrell plays Mayor Col Dunkley in Grass Roots. Scheming, bureaucracy and infighting—and that was just behind the scenes. Sacha Molitorisz gets political with the cast and crew of Grass Roots. Everyone must have horror stories," says Peter Andrikidis. "We recently put on an extension [on our house], and though we had it approved in the end, there were dramas. It's incredible, the corruption that goes on." Andrikidis, the director of Grass Roots, is talking about his local council. That is, he's talking about bureaucracy, backstabbing and petty politics. Which is appropriate, because that's the subject of Grass Roots, the satirical drama series about local government which returns to the ABC this month. The funny thing is, the AFI-award winning Andrikidis could just as easily be talking about the making of Grass Roots—even though he probably wouldn't use the word corruption. Behind the scenes, there have been dramas aplenty. When the first series of Grass Roots aired on the ABC in 2000, it attracted exceptional reviews and a healthy, loyal audience. The combination of clever writing by Geoffrey Atherden (Mother and Son) and brilliant performances from Geoff Morrell, Sacha Horler and Chris Haywood, among many others, created a witty, gripping satire about the fictional—but oh-so-believable—Arcadia Waters Council on Sydney's northern beaches. Though it didn't garner the runaway audience of SeaChange, the eight initial episodes had soon won five AFI awards, including best actor, best writer and best director. And then? Nothing. "It was delayed for so long with all those various political machinations at the ABC," says Morrell, who took home one of those AFI awards for his role as Mayor Col Dunkley. Morrell is referring to the instability that flourished under Jonathan Shier, the incendiary device who was the ABC's managing director until late 2001. "I honestly thought that after they didn't make [series two] after a year, that was it," says Morrell. "Invariably in television, if it doesn't go within 12 months, you can usually say goodbye to it." Fortunately, saying goodbye would have been premature. "When Sandra Levy came to the ABC it coincided with the enormous outcry about all the British reruns," Morrell says. "Luckily for us, we were the only local production ready to go." And so, in late 2001, just as Shier was pocketing his payout, filming began on series two. In other words, after much heartache and behind-the-scenes manoeuvring, Grass Roots was finally granted permission to build its extension. The less satisfying news was that another delay loomed just getting the finished show to air. Atherden has a simple explanation. "The ABC has been waiting for space to show all 18 episodes, I believe," he says. "That's the eight episodes from series one and 10 from series two. Once they realised it follows on so naturally, they wanted to make that space in the schedule." Now, finally, series two is locked in to premiere on Wednesday, March 19, immediately following the current season of reruns. And here's the funny bit: those delays suit the subject matter perfectly, given that inefficiency and council are often considered synonyms. "I talked to someone the other day who's involved in Byron Bay Council," laughs Atherden. "They started their first meeting of the year in the second week of January, and they haven't finished that meeting yet. They haven't got to end of the agenda." In a bizarre way, the delays have also made Grass Roots more timely. Recently, it seems, Australians have become politically motivated. Last month, an estimated 500,000 demonstrated nationally against a US-led war on Iraq; later this month, a State election will be held in NSW—a fact that many people actually seem to have noticed. It's as if the populace has discovered a hitherto unrealised love for placards and platforms. At the same time, local politicians have been as shonky as ever. At Rockdale City Council, for instance, two councillors resigned in disgrace last year after an ICAC inquiry recommended criminal charges be laid against six people. In this context, Grass Roots captures the Zeitgeist perfectly. "Recently, we've had what's happened at Rockdale Council, at Warringah Council, and various others, and the things that happened there turn up in series two," says Atherden. "But that's purely by coincidence, because we'd finished shooting by the time all that was making news. "When we choose our stories, we choose good stories, but they should have more than just an individual application. In the first series, the episode about selling off the child-care centre, that resonated right around the country, because most councils have done it." How true-to-life is Grass Roots? Morrell tells the story of meeting Simon Crean back in the days when the Labor Party leader was just a shadow minister. "Col Dunkley is someone I would like to have on my team," Crean told him. "He's someone who gets things done." Morrell is moderately sure Crean was joking. Similarly, Atherden recently heard of a council north of Perth which is debating whether to name itself Arcadia Waters. "Politicians love the show," says Morrell. "They look at you with a knowing smile. They obviously relate to it very much." Atherden agrees: "After series one, it was astonishing how many people from different parts of the country told us the same thing, 'We know that was us in that episode, and we know who leaked.' But so often they were wrong." Series two covers a new range of issues that regularly beset local government: the proliferation of dog droppings; prostitution; young people who skateboard in public places; eyesore developments; and a State government investigation into the council's workings. Meanwhile, Col is feeling the stress at home. Having previously professed his affections for independent councillor Karin (Rhondda Findelton), Col is doing his best to develop a smooth working relationship with her when his wife Julie (Tara Morice) returns to resurrect their relationship. "We push a bit harder in this series in that area of the personal being political," says Atherden. "That is, in the way that things going on in someone's personal life affect their public life. We don't want to be The Bill—we haven't suddenly become a soap. But we are seeing how these stresses at home affect Col."
"In the second series we see more of what Col's idealism was," says Morrell, who is on the set of John Doyle's new drama, Marking Time. "The general perception of him is that he's a baddie, but in the second series we see he does have a vision, but that he can't do anything unless he maintains that power. To me one of the great things about Grass Roots is the notion that people go into politics for altruistic reasons. Geoffrey's writing exposes the difficulties of maintaining those ideals while holding onto power and making deals to get things through. "And on that level of local politics Geoffrey is mirroring what's happening on a state level and nationally. For instance, we touch on the political machinations of the Tampa issue. In one episode, a Down Syndrome hostel is going to be built next to the mayor's house. Very subtly, without ever being discriminatory himself, he allows the public to have their reaction, and they then put a stop to it. Col knows that the way to get this stopped is to be like John Howard. It's a beautiful bit of writing." The quality of the writing has also benefited from the show's long gestation. Atherden developed the scripts for series two over several years, just as he had for series one. After each script was revised and revised, the whole of the series was finished before shooting began. Then Andrikidis was able to work extremely quickly, as the low budget required. Atherden says that feature film directors often shoot three or four minutes of a script per day; for Grass Roots Andrikidis shot roughly 10 minutes a day. "The output rate is terrific," says Atherden. "Even though we were always rushed on set, at least we were working with material that will support you," says Morrell. "Most of the time if you do one episode of something, there's invariably something that's not quite there in the script. Here you don't have to save the material. You can work fast, because you're not trying to make a purse out of a sow's ear." That on-set efficiency is aided by the experienced, talented cast, which includes Rhys Muldoon as the council's general manager, Lucy Bell as the media manager, Zoe Carides as the officer for community and cultural services, John Clayton as deputy mayor, Judi Farr as Col's secretary, Mary Coustas as a journalist, and Michael Craig and Sandy Gore as councillors. The one major change for series two is the departure of Sophie Heathcote as Biddy Marchant, the ambitious thorn in Col's side. She is replaced by Jodie Dry, from Heroes' Mountain and White Collar Blue. "What you are able to do at the ABC—with limited funds—is to be storytellers rather than sellers," says Morrell. "A lot of television in Australia is copied on the American model, which is just the stuff between the ads. I'm not knocking that. It provides a lot of employment and I've done it myself. But we're not trying to sell toothpaste here. Sometimes, working with the ABC can be problematic, but at least you're working from the basis that you're all here storytelling." Atherden says the ABC is bouncing back nicely after all the recent turmoil and ugliness. "They still have the problem that they're broke, but they're absolutely on the lookout for drama. And now, after all the changes, no one is left at the ABC who was involved in the first series, but everyone there is clearly behind us. We've got terrific support." Morrell is equally optimistic. "I think the audience it did develop last time are not fly-by-nighters," he says. "I think our viewers are the sort who are solidly in there, and hopefully this time we'll pick up a few more." Sounds like he's on the campaign trail.